ALHAMDULILLAH WE HAVE HAD AN UNANNOUNCED OFSTED INSPECTION IN OCTOBER 2017 AND WE HAVE PASSED ALL THE INDEPENDANT SCHOOL STANDARDS. PLEASE READ THE LATEST REPORT UNDER THE TAB ‘OUR STUDENTS’. At Hafs we believe that the tarbiyah (development) of a child in a good environment is of utmost priority. Children are innocent and so it is during these days of innocence that tarbiyah is most effective. 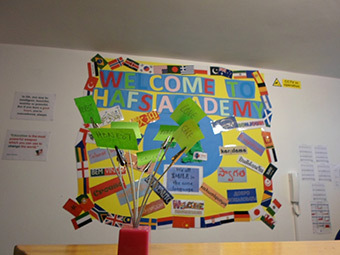 Hafs Academy provides an exceptional standard of education, with numerous extra-curricular activities and strong pastoral care. Dear Parents, Please note Hafs Academy will remain closed for all students on Wednesday 27th March 2019 for Staff INSET. Please note all Students will be starting school at 12pm on Tuesday 26th March 2019 due to Staff Training. WRAP Training will take place on Tuesday 26th March 2019 from 9:30am to 11:30am for all members of Staff and Trustees. A HUGE WELL DONE TO QASIM SALAHUDDIN OF 8H FOR ACHIEVING SILVER IN THE UK SENIOR MATHEMATICAL CHALLENGE. Teachers will explore in tutorial sessions what Islamophobia is and how this relates to hate crime. They will also be taught how to report hate crime. A tutorial session will take place this week across Key stage 3 and 4 covering risks associated with Teenagers involved in Gambling. This session will explore how easy it is to be addicted to online gambling and risks associated with it such as Depression, Anti-Social Behaviour, Drinking Problems, Family Breakdown, Homelessness and Mental Health Issues. An Assembly took place on 01/10/2018 for Key Stage 4 titled “Attendance and Achievement”. School Lock down drill took place on Thursday 18th October 2018. An Assembly will be delivered for Key Stage 4 Students titled “OPEN DAYS: Why should you attend?” on the 19th November 2018. Shiekh Mujahid Ali will deliver an Assembly titled “Key Stage 4 Islamic Studies – What Careers can you pursue?” on 5th November 2018. Protected Characteristics and Single Equality Act 2010 will be explored in the assembly on 26th November 2018 by the Head Teacher. Fundamental British Values will be explored in the assembly on 19th November 2018 by the Head Teacher. Friday 21st December 2018 will be Half day. Hafs Academy will remain closed from 24th December 2018 to 4th of January 2019. Students are to return to school on the 7th of January 2019. In Tutorials, All students were made aware of the Black History Month (October 2018). As part of SMSC, each subject introduced a black luminary from BME community. As part of Key Stage 3 Citizenship, Martin Luther King’s Famous Speech was analysed. Dear Parents, Hafs Academy Ramadan timetable will commence from 17th May 2018. School will start at 10am and end at 4pm on Monday to thursday and on Friday the school will start at 10am and finish at 2:50pm. UMC Athletic tournament will be held on the 24th April 2018 for all the students. We will be spending the whole day at the venue. Dear Parents, All the students of Hafs Academy will be going to the Science Museum on Wednesday 28th March 2018. Dear Parents Staff Inset has been arranged for the Monday 16th April 2018. Children will be off on the day. Hafs Academy wishes to issue the following statement following the conviction of Mr Umar Haque for preparing acts of terrorism. We are deeply shocked and saddened by the nature of the crimes of which Haque and his co-defendants have been found guilty, and that a terror attack was being planned by members of this community. Important Notice: Hafs Academy will be closed from Monday 12th June 2017 for 2 weeks for Half Term and Ramadan Break. The school will reopen on 27th June 2017.